How cute are these clothes?! These are some of our favorite pieces from our lovely sponsor, Kiki La Rue. Kiki La Rue is an online boutique that sells the latest trends at affordable prices. To make Kiki La Rue even awesomer (yes, that's a word. 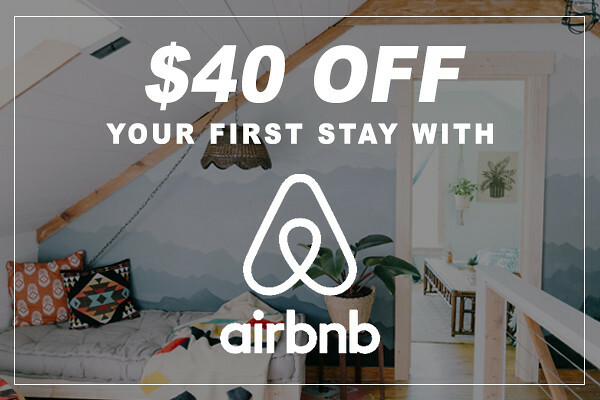 ok, no it's not) they are giving away a $50 gift card to one of our delightful blog readers! 4) Leave a comment telling us one of your favorite pieces from Kiki La Rue. Giveaway ends Friday, May 18th at midnight (central time). Also, because Kiki La Rue is oh so generous, they are offering free shipping all week long. Holler. Enter the code OHSOPRETTY at checkout to receive free shipping. Pretty sweet! Good luck, ladies (and maybe gentleman) and don't forget to check out Kiki La Rue's online boutique. I am a follower. Love your blog! I'm really loving the #3 Sail Away Striped Maxi Dress. The bust line is great! I love v centered strips in the middle they really add flair to a simple chic dress. pairing it with my favorite pair of wedges would be awesome. The Lanie Dress is SO cute! the santa monic blvd dress and the havanna nights dress are both super cute and summery! I'm totally loving the sailaway striped maxi. So cute!!! the sail away striped maxi! it's perfect for summer!! I need the Monaco Maxi!!! Anchors away is adorable, and I am IN LOVE with the lemon lined and jagged edge dresse. Perfect for summer! I am absolutely in love with the Havana Nights Maxi dress! The print is so vibrant and lively. It is the perfect summer's night out dress! I follow the blog on Google Reader! I love the Depths of the Ocean tunic. Beautiful color! I love the Monaco Maxi in Purple! My favorite is Monaco Maxi in orange. It's super cute! It's a tie between the Havana Nights Maxi and the Chichen Itza Tunic! What a great site, Thanks! I follow your blog via Blogloving, but do not have a twitter account. I'm in love with #3! I am a follower and love the Sweet Love Summertime romper!!! Too cute! I follow you and love your blog! I love the Rodeo Drive Maxi!! How cute! Follow you all on Twitter & Liked Kiki; Love their Linen pants, perfect for summer & the Miss Direction print dress is ah-mazing! I like Kiki La Rue on Fb and I follow your blog! I love the Sail Away Striped Maxi and the kandayce romper!! Did all the requirements for an entry! I would get the Electric Connection Dress and the Mallory Mae Top! Sleeveless Southern Bell Top is so cute! I love so much but I love the Lanie dress more and more! OBSESSED with the monaco maxi!!! Gosh, so many beautiful things! The Scarlett Dress though, beautiful! oh! I love Kiki La Rue!! I love all of their dresses, but if I had to choose I would pick the Kristin Maxi! So cute and I love all the colors! I love the Sailed Away Striped Maxi! Followed,Followed,and Liked. I love the double framed wallet clutch! I am now in love with all of their maxis! but the Allison Maxi is at the top of my wish list! I want a maxi dress so bad, love the stripes! also the tank top... so cute! LOOOOOOVE the Jet Zag Dress and the Boyfriend Tunic! Gorgeous designs. And love this giveaway. I love the Easy Breezy dress, so gorgeous, the Royalty dress is a close second! I love your giveaways! I am follower of this blog, KLR on twitter, and you on twitter! My favorite item is boyfriend tunic in Jade! I follow this blog, like Kiki La Rue on Facebook, and my favorite item is the Jackie O Wrap Dress! I have been eyeballing the Lemon Lined Dress at KLR since March. I'm looking forward to following your blog! the tuesday tank! i have it on now and love it! I love, love, love the Monaco Maxi dress in purple! What a lovely blog you girls have! Definitely going to need to try some of these things! followed your blog! followed your twitter (mylifeis_a_song)! 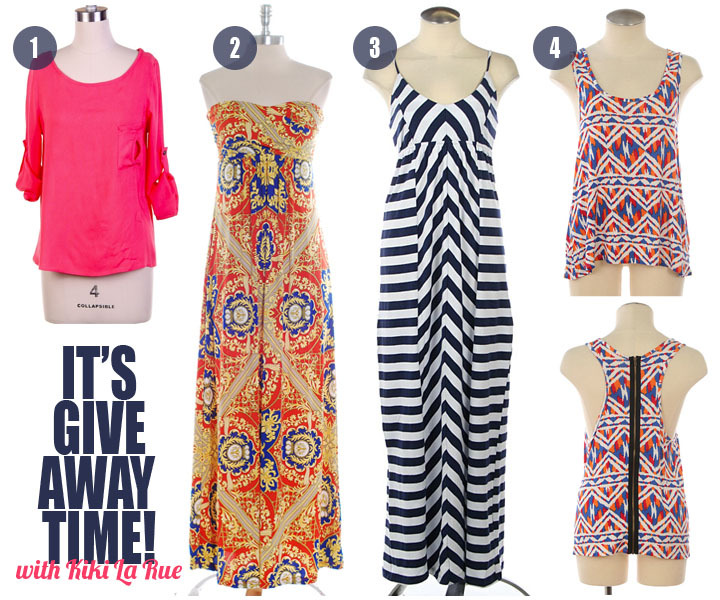 my favorite piece is definitely the Scarlett Dress or the Zipped To Be Tied Dress or the Sail Away Striped Maxi! AHHH i cant decide! I love the watercolor tank and the Lanie dress! I am so excited to discover your blog -- found you via Pinterest. I love the dresses -- the One Shoulder Wonder dress is my particular fav! Following all. My fave? Ha, yeah right!! Too many to list. I'll have to say one of the maxi dresses. GORGEOUS!! Following you on FB and twitter. Already follow Kiki La Rue on Fb. My fave is the Monaco dress in orange and blue..thanks for the chance to win! OK I follow your blog and on twitter and I like KiKi La'Rue on FB! my fave piece is: the RODEO DRIVE MAXI IN ORANGE!! I absolutely adore the purple chastity maxi!!! Of course, there are so many others that I adore as well, but this is my newest fave!!! I follow your blog and on twitter (@rmarief)and I like KLR on Facebook. My Fave right now is the Watercolor Tank. I am loving the exposed zipper. LOVE the Jet Zag dress! This give away if TOO much to handle!